Carbon emissions reduction, sustainablephoto of green land development and ecological awareness are global trends which have inspired the vision for New Taipei City’s development of a “Green Future City”. Well-balanced and sustainable development requires efficient resource utilization, pollution control and reduction, and environmental protection to create economic growth, while improving the environment and quality of life. Industries can exploit new business opportunities created by the green movement so that urban development and environmental protection can proceed hand in hand. 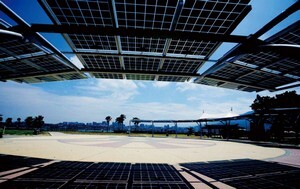 New Taipei City has successfully reduced carbon emissions by actively installing solar and other renewable energy facilities. There are over 150,000 students in 18 universities throughout New Taipei City. The city is also home to 17 vocational schools. These institutions of higher education provide industries with opportunities to recruit high-quality personnel though training programs, and also help businesses improve their management, R&D and innovation standards. The “Carbon Reduction Clinic” pioneered by New Taipei City provides homes and businesses with general consultation, as well as on-site and home inspections of lighting, air-conditioning, electricity, recycling and water-saving systems, building “green” buildings, and thermal insultation. The clinic’s efforts are supplemented by low-carbon community subsidies that help residential complexes and commercial buildings improve their energy efficiency. In addition, sixty business locations currently receive assistance in carrying out energy-saving and greenhouse gas audits, as part of New Taipei City’s efforts to become a green low-carbon city. To help businesses adapt to the efforts toward becoming green industries, New Taipei City implemented the “Assist Industries with Cleaner Production Plan”. The plan helps industries improve their environmental protection practices; reduce carbon emissions, and lower production costs. To date, over 80 companies have received carbon reduction assistance, reducing CO2 emissions by more than 35,000 tonnes. The city government is also actively promoting green energy industries and smart electric vehicles. Solar and other renewable energy facilities have been installed in over 30 locations as part of a trial project, while low-carbon ransportation initiatives, including smart electric vehicles and car-pooling, are being tested in areas such as Pinglin. The green industry will be one of the key future industries for New Taipei City. 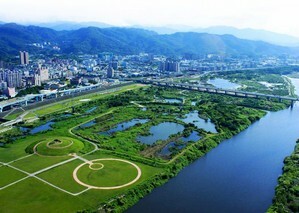 Currently, the city has the highest concentration of green companies in Taiwan. Some 240 companies, including Everlight Electronics, Unity Opto Technology Co., Ltd, Nan Ya Photonics Inc., and Top Energy Saving System Corp. are all producing green products, such as hydrogen and fuel cell batteries, electric vehicles, bio-fuels, LED lighting, solar paneling and wind turbines. Green industry clustering is taking place, and will be the focus of New Taipei City’s future economic development.